Stop short-changing your midsection! Construct a powerful core with these secret-but-superior movements. Abs are indeed made in the kitchen, but the proper ingredients include exercises. A dash of good DNA can help, too, but only training builds the 6-pack that a clean diet can reveal. Light crunches and side bends help, but they're only spices. The meat of this "ab recipe" needs to be serious training moves, many of which are almost criminally obscure in this age of ab gadgets. The advantages of these exercises go beyond aesthetics though. Abdominal training is vital to maintaining a healthy spine and hips, and it's also essential in a functional sense. Like a baseball team's defense, you're only as strong as you are up the middle. Add these moves to your abdominal arsenal, and you'll be amazed by what a real 6-pack - yours - looks like. 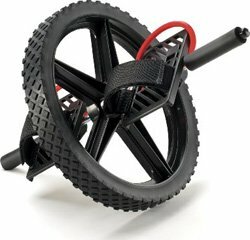 Most have seen the $5 ab wheel you hold with your hands, but I have never seen anyone actually use the version that straps to the feet. Don't have a Power Wheel? That's no problem; just use some rollerblades to do the same thing! While seated, strap your feet to the power wheel (or to your roller blades). Turn over into a plank position, supporting your weight on your hands and feet (via the wheel). Maintaining good posture, pull your feet toward your hands. Attempt to keep your knees straight, raising your hips to draw your feet forward. Pause, and then slowly roll out to the starting position. An alternative method is to treat the movement as a reverse crunch by not raising your hips, drawing your knees toward your chest. This is the hardest ab movement you can do. No wonder Bruce Lee loved it. For amazing core strength and the ability to upside-down-kick someone in the face, enter the Dragon Flags. 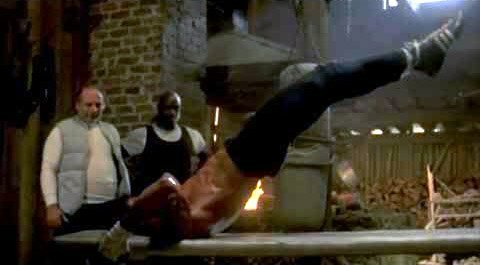 Photograph: Courtesy of © United Artists and © MGM/UA Entertainment Co.
Lay flat on your back in a spot where you can reach back to grab something that anchors you. Keeping your torso rigid, raise your legs and hips up until you're on your shoulder blades, feet pointing straight up. This will be your starting position. Lower your legs until they are 6-to-12 inches from the floor, ensuring your hips stay off the floor. Pause, and return to the starting position. I am an "anti" kind of guy. I think "core" training is better trained by anti-extension or anti-rotation than by crunch-like movements. In this exercise, take a heavy dumbbell in one hand and walk for a time or distance for some functional training. Take a dumbbell or other heavy object in one hand. Stand as straight as you can, begin walking, and hold the weight on one side. Turn around and come back. I'll be the first to admit this one doesn't look like much to the uninitiated, but it serves its purpose well, especially for those with problems in the hips and back. Done properly, it's difficult to perform for any duration and enhances control of the pelvic girdle. Begin by lying on your back, knees up and bent to 90 degrees. Extend your arms straight overhead and hold this position for a moment; make sure your abs are tight and your back isn't arching off the floor. Slowly lower your right arm and left leg toward the floor while keeping your lower back in touch with the floor. Bring your right arm and left leg back up, and then lower your left arm and right leg to the floor. Continue lowering opposite arms and legs for a total of 10 reps. Don't compensate by moving your pelvis. If it's easy, you're cheating. If you thought we were done with planking movements, think again, sucka. The ball crawl adds a dynamic twist to the static plank, which may be too easy for advanced trainees. I first learned this movement in Jiu Jitsu. Any of you grapplers will see its carryover into the sport. 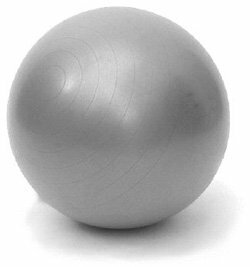 Assume a plank position with your forearms resting on a ball. Don't let your hips sag or stick up. Begin the movement by moving one elbow directly forward, then take a short step with the opposite leg to bring you back to the starting position. Alternate the elbow/leg combination to progressively walk/roll the ball forward. A big problem with traditional sit-ups is that they affect the hip flexors more than they work the abs. However, doing it froggy-style takes the hip flexor out of it. Combining that with the limited range of motion makes this a friendly alternative to the archaic crunch. Lie with your back flat on the floor (or exercise mat) and your legs extended in front of you. Bend at the knees and place your outer thighs by the floor (or mat); you make the soles of your feet touch each other. Now try pushing both soles and bringing them up as near to your hips as possible while you keep the outer thighs on the floor (or at least almost touching it). Cross your arms in front of you by touching the opposite shoulders. This will be your starting position. Exhale and keep your lower back to the floor while curling your torso. This will be like performing the first 1/4 movement of a sit-up. Hold at the top position for one second. As you inhale, slowly lower back to the starting position. 'What? That's not an ab move!' Don't send the angry letters just yet. Most of my favorite movements don't isolate muscles, but instead work the body as a system. Let's take a look at what role the abs play in this type of exercise. The primary role of the abs isn't spinal flexion, but anti-spinal extension. During movements where your back extensors have to contract strongly, a counter-force is needed to keep your spine from ripping in half. (Nice image, huh?) Your rectus abdominis (and crew) plays this role. Personally, nothing has fried my core more than having to hold a heavy weight in front of me or above my head. This can be performed in a variety of ways, limited only to your imagination and what you have on hand. You could use: a Conan's wheel, a keg, a slosh pipe, an axle, or a lot of other things. We will discuss it via the Sandbag Carry. Use a weight according to your abilities, but I recommend you go as heavy as you are able. As a reference, I use an Army canvas duffle bag stuffed with 240 pounds of gravel. Begin by lifting the sandbag. 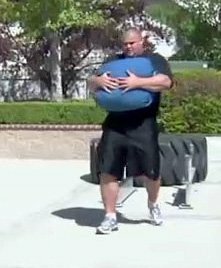 Sandbags are extremely awkward, and the manner of lifting them can vary depending on the particular sandbag used. Reach as far around it as possible, extending through the hips and knees to pull it up high; carry it on your chest with both arms. I recommend carrying it for max distance. I use a 60-foot length of sidewalk in front my house, making turns when necessary, usually making it to 300-400 feet.